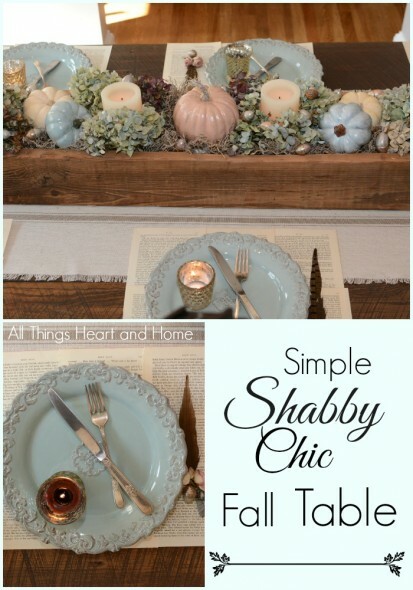 Like most things I do, this table is easy to put together and most of what you see here are things you already have! 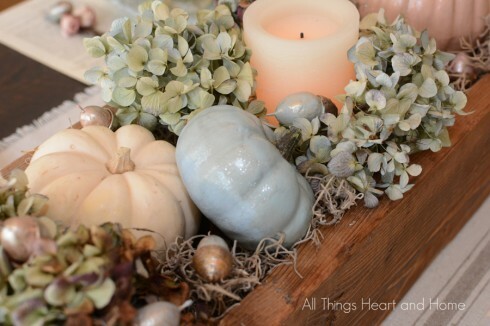 I like to have some sort of inspiration to use as a jumping off point when I decorate or even set a table…with this table I painted a few soft color pumpkins and they inspired the other elements on the table! 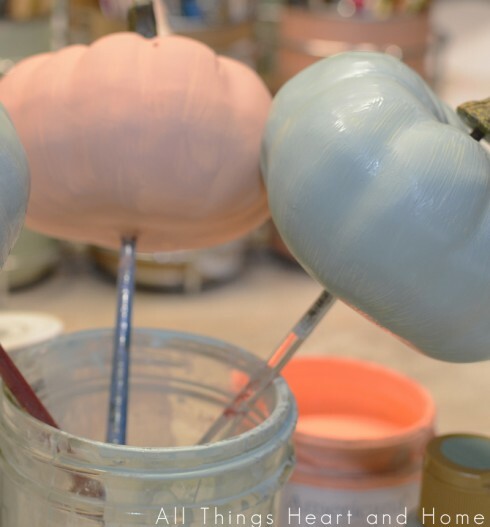 Then water down a bit of Americana Multi-Surface Metallic Silver and paint a thin coat over the (dry) pumpkins. The Multi-Surface Metallic is perfect to give a beautiful shimmer over other colors. 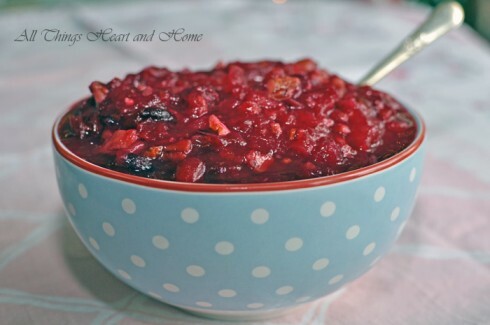 And speaking of menu…I want to share our families favorite Cranberry Relish with you! This is just amazing with the traditional turkey and dressing and we love to add a spoonful of the leftovers to a turkey sandwich the next day! *Drain pineapple juices into measuring cup-put 1/2 – 3/4 cup of the juice into medium pot. *Add cranberries, sugar, orange zest (lightly grate the peel right into the pot), small pieces of the orange, pineapple and nuts. *Stir while bringing to a boil. Cook over medium heat until all of the berries are popped and mixture is thickened. *Cool and serve with turkey and dressing or on a turkey sandwich! Absolutely stunning! I love everything that you do! What type of dishes do you have displayed on this table? Stunning! Thank you for your inspiration and incredible taste! 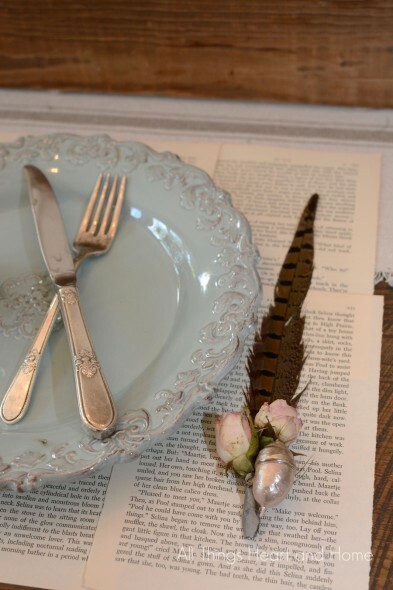 What a beautiful table setting! Simple, yet elegant. 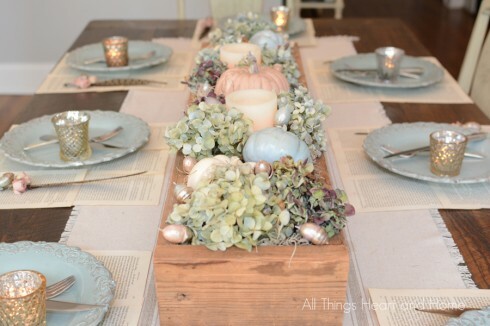 Love your tablescape and the pretty colors you have chosen. 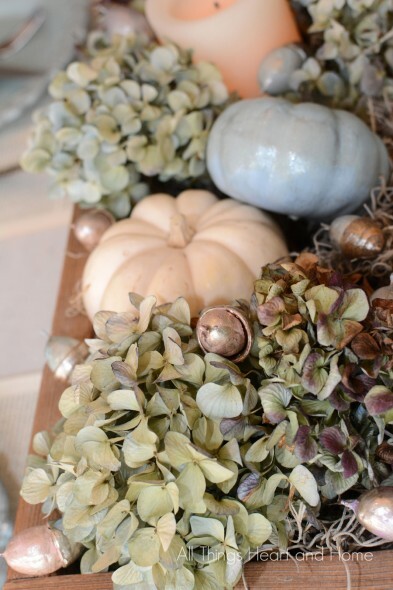 Love hydrangeas and they always add an extra wow factor to any table. Have a great week! This really is very pretty! You did an awesome job. 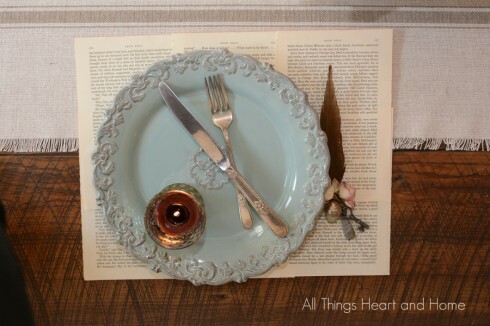 It feels traditional and yet a little non-traditional at the same time! That takes skill! WOW! Stopping by from Think and Make Thursdays. 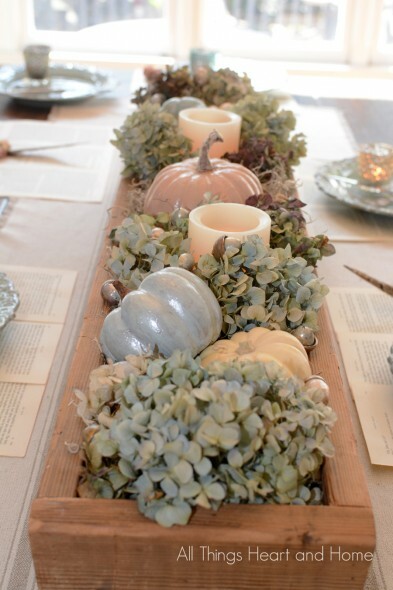 I am soon impressed by this tablescape. It is so beautiful! Pinned! Good Morning Robin and Happy Halloween. 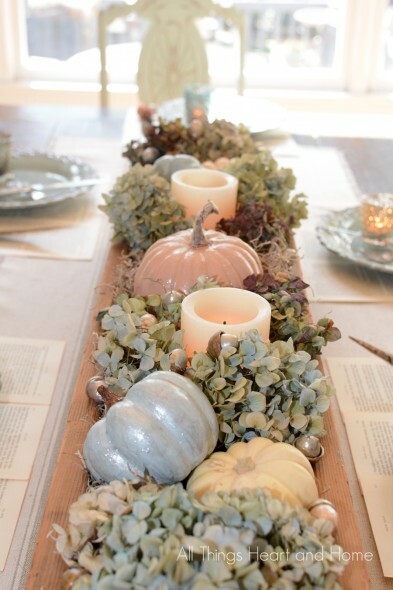 What a very pretty and creative take on traditional fall decorating. And don’t you just love the versatility of a long narrow box! I brought mine home this time last year and have used it so much, for every season and every holiday. Are you gluten free? Your comment makes me think so. I am and it’s so difficult, especially as I’m dairy free, too. Love the soft pretty colors you chose. Makes it different and elegant. Very nice eye you have.